after long and very hot summer, I have returned with Ella The rainbow Doll. Las week I had friend over for a visit, who came with her 6 year old daughter Ella. After I showed Ella my crocheted dolls collection she had hard time deciding which one was her favorite. So I offered her a deal. I told her I would make her the most special off all dolls, doll she dreams of. In order to make her wish come true, I asked I gave her colored pencils and markers and asked her to draw such doll. Told her to take her time, to take some time thinking and when completely sure to draw her dream doll. On the left side of the drawing you can see tarantula, while on the right side, giant African millipede is crawling. I keep few of such lovely creatures (many of you will have goosebumps hearing this 🙂 ) as pets, and Ella loved seeing them. She was specially fascinated by giant African millipedes and their size, as well as hissing Madagascar cockroaches who hissed at her every time she came near. Now I had the drawing and next day had to start making this lovely doll we named Rainbow Princess. As with starting any other doll, important is to know which shapes to use, where to start, and to prepare your material in advance. I finished this lovely princess in one day. It was wonderful experience and so much fun to return to childhood and create something so simple and something so extraordinary and beautiful as Rainbow Princess Ella had drawn. Colors she has chosen, the way she put them together. High heel boots in orange color that were must have…. and so many other details that were so much fun to make. I remember, when I saw the drawing for the first time, my first thought was “oh, nooooo”… for the open mouth with tongue showing. I was so worried and thought of ways making such mouth without many complications while crocheting. At the end decided to simply draw the mouth using textile paints and apply them as more as drawing than to fill each stitch with color trying to make them as perfect as possible. At the end it worked nice (so I think). At the end Ella was thrilled with her doll. Do you know what amazed her the most? 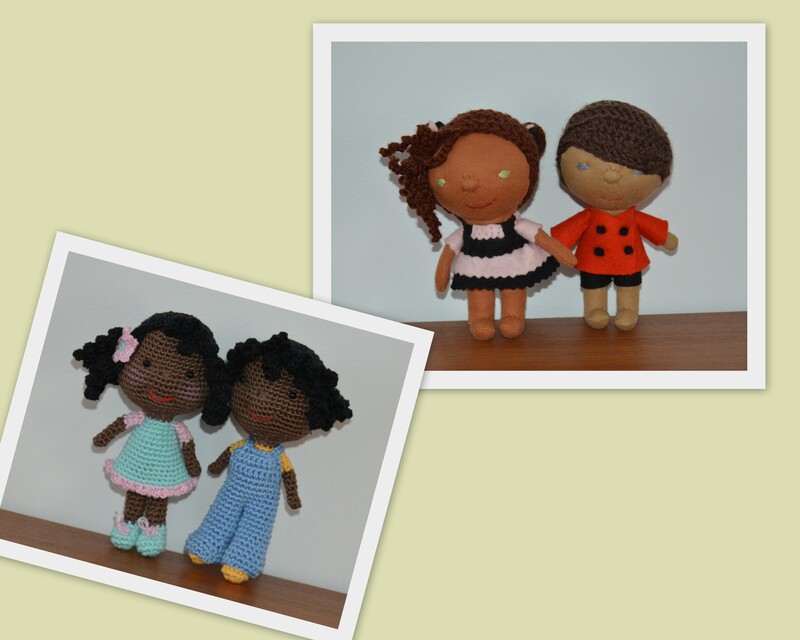 If you have a little child or grand child and you don’t know what doll to crochet for them. Ask them to draw doll they’d like to have, and simply make one. Same as your child has drawn in simple way, you crochet that simple. Keep an eye on details and colors. Those are important. If you make or fail the shape of head, or body, or make legs little shorter or even longer, child won’t notice that. On another hand, don’t forget to add details as fingers, use exact colors on locations your child drawn them, if doll has eyelashes, add them, if there is one single polka dot on drawn dress, don’t forget to make it on your doll too. Those little things are what children won’t forget and will check your work to see if it matches their drawing. I warmly recommend you try this, making a doll or toy based on your child’s drawing. Happiness when they see their dream doll come to life, is priceless. 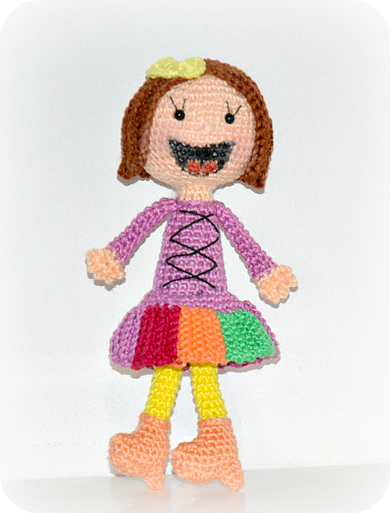 Really hope you like little Ella The Rainbow Doll. If you wish to make doll based on your child’s drawing but not sure where to start, feel free to write and I will try to help you. This is not the only project I’ve done this summer. I was not near PC and internet each day, but whenever I had little bit of time (and when it was not hell hot), I did work a little. In the following weeks there will be several patterns I’ll share for free and sale. One piece dolls work in details( project)…general information will be shared here, but on actual project we will work through FB group. Thank you all for your time stopping by and reading this post. Hope you’ve enjoyed Ella the Rainbow Princess. After almost one moth of break from new posts, returning with, I hope, lovable gift to you all. New crochet addition to all Waldorf admirers. Simple testing the head for this pattern has taken our little Facebook group into wonderful doll making adventure. Many new ideas opened and new patterns were created. 25 wonderful and kind ladies have applied to test the pattern. Those that finished came up with the most adorable little princess dolls 🙂 Some we still wait to finish their projects. If ladies agree I will post their photos for all of you to see. What I am specially satisfied that not matter which weight yarn or size hook was used, the pattern worked well for all. My baby grew to little girl very fast. It is amazing how fast the kids grow these days!!! 🙂 Like mushrooms after the rain. One day I saw her bald and crying and the next one she asked for her hair to be done! The next day her friend showed …. The pattern is pretty long. Pattern has several additions. I will try to explain what each of them will bring and you cna choose from. Basic Waldorf Inspired Baby includes instructions on how to crochet baby’s body from head to toe. During testing the pattern, one of tester ladies and my dear friend wanted to make baby with open mouth, or the mouth baby can place her finger in, pacifier or baby bottle. Based on Waldorf’s baby head she made adjustments and came up with open mouth head which is absolute must have. I warmly recommend everyone to try this technique not just for this baby head, but for any of your baby heads in the future. Thanks to wonderful friend and generous and kind TB Cess, this pattern we can share as addition to basic Waldorf Baby. This head required more bent arms, so the hand and sucking finger can reach the mouth easily. For that reason I adjusted and added one more pattern for arms. Called it Sucking finger arms. You can make each arm different and still keep the same size and proportion of your baby. Rounds on both arms (one you can find in basic pattern and this one) are equal. The only difference is thumb crocheted separately and added later to position you prefer and position that matches baby’s mouth the best, and this arm is bent little bit more in the elbow. Hair for Waldorf doll’s I made and I always make following Beth Webber’s photo tutorial. This is the best one on the web I have encountered so far and all of you who are following me for long time by now, know that I keep repeating myself and suggesting By Hook By Hand blog any time I can, because Beth always inspires me with her doll creations. Her patterns and tutorials are easy to follow and yet all are masterly made. Following this tutorial I have made simple wig cap, and here are few details. What I have said to the ladies who tested the pattern, when working on the wig, so will tell you too. Same as with crochet work, in wig making and waving the hairs on, you have right and wrong side. While following Beth’s tutorial, pay attention on how the hairs are waved to the wig. It makes huge difference later. If you will need more help regarding this, please feel free to ask and I will make a short post, showing you through photos what exactly to pay attention to. At the end what is left are the clothes. Clothes are crocheted in No.5 thread and still using 2 mm hook. Writing pattern for babies clothes and making it perfect to fit everyone, if you ask me, is the hardest part for most of us who write patterns wishing the pattern will work the same for all. For that reason I tried to make pattern(s) easy enough so each and every one of you can adjust the stitch count based on yarn and hook used. Important is to work with lighter yarn and adjust the stitch count accordingly. By any chance don’t try crocheting clothes with same weight yarn as doll was made of, or even worse, using heavier one. Clothes needs to be light and fluffy. For this doll I have tried to keep clothes old fashioned. Little by little we came to the end 🙂 I hope I haven’t missed anything. Hope you have enjoyed seeing this new baby pattern, and even more I hope you will enjoy every second while making one. For any questions, please feel free to write and ask. Wishing you all happy, relaxing and blessed weekend. It is never late to start preparing for the winter season and by season I mean Christmas! Have many ideas for new patterns this year and hope I will have time to make and share all of them with you. Starting with my new Winter Dolls. Elf on the shelf and his mischief girlfriends are coming next and then if time, will show you little smiling snowflakes and this year’s additions to Christmas ornaments. 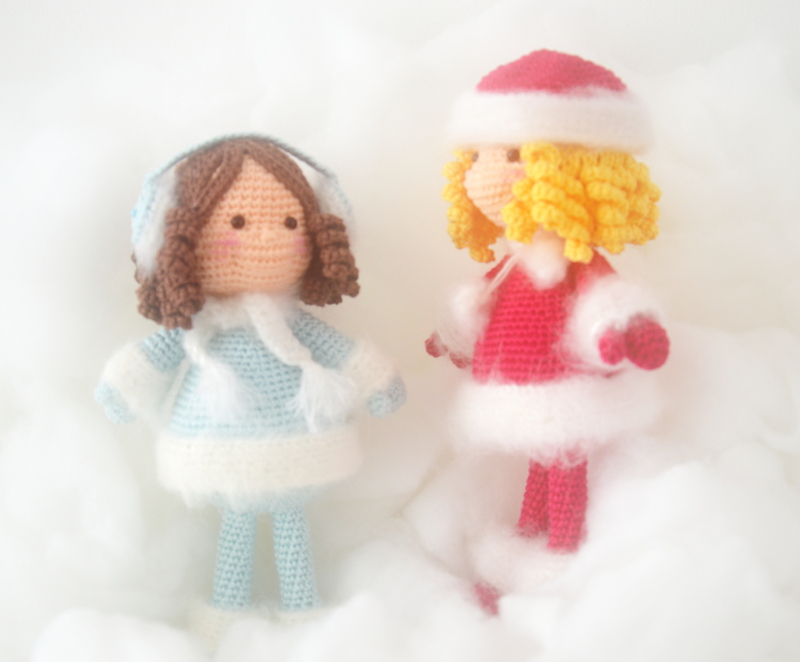 Let us start with little Winter Dolls! cardboard pieces or anything else you can use for extra support in the soles of doll’s shoes. Work in continuous rounds unless specified different. Try to make tough and firm stitches. Stuff firm! if you are using safety eyes, your eyes will come in the middle of these two rounds (R13-R14). Make sure to mark the middle of the face (round below you will embroider tiny doll’s nose around 2-3 horizontal stitches). Leave 4-5 stitches between eyes. tie off leaving long end for sewing the nose and to do face sculpting if desired. Finish stuffing. On how to needle sculpt doll’s face you can find here. we will work around the chain in order to create oval shape for the foot. Using some scrap cardboard, create the sole for the shoe and place it inside. For additional firmness you can glue it to inside, on the bottom of the shoe. stuff the bottom of the shoe very firm. Tie off. Before stuffing decide if extra support (wire or similar) will be added. Measure, cut and add together with stuffing. R1 Bring both legs together. Both pointing same direction. Mark three stitches on each leg, those that you will touching each other when legs brought together. Slip stitch to the first stitch facing you (on either one of the legs, or either side), and chain 3 sts. Bring the next leg close and slip stitch to the opposite stitch on the second leg, one that is closest and matching stitch you started the chain. Slip stitch to the next stitch of the same leg. Chain one stitch, turn your work and single crochet 3 stitches on the chain you previously made). Once done with 3sc, slip stitch to the middle stitch on the first leg. Slip stitch to the last stitch, chain 1 st, turn. One more time, make 3 single crochet stitches (2 row on your chain, connecting legs). Slip stitch to the remaining, third stitch on the opposite leg, chain one turn. What we just did, we increased the gap between the legs, but we haven’t change the stitch count. begin stuffing and continue as you go. Stuff the body as firm as you can. finish stuffing the body, tie off leaving long end for sewing body to the head later. From round 11 to round 20 decrease 1 each round. Stuff the arm as you go. Leave the top of the arm empty or stuffed very light. Tie off leaving long end for sewing arm to the body. Each chain we make (4 of them) will start and return to this magic ring. Do not close the ring until the hair is done completely. R13 *ch21, starting from second chain from the hook inc20, slip stitch to the next st, sc to next st* repeat until you make 15 curls. Tie off. Close the magic ring. Hide ends. Glue the hair to the head. Arrange fringes the way you like them to be. Edgings can be done many ways. I used mixture of mohair and acrylic yarn (that I brushed later), and crocheted it directly to doll, using front loops we left free on some rounds. If you are going to do this, make sure yarn is similar weight to yarn you made your doll with, so your stitches don’t stretch to much being too small or they don’t end up bulky and much heavier than coat or hat or boots. My yarn was much thinner and lighter that cotton I used for the doll, so I worked with two treads to reach desired thickness. I crocheted directly on the doll, making same stitch count of those front loops left and stitched each piece for 5 rounds. Brushed after I was finished. What you can do instead is to make stripes. Use the width of those 5 rounds we left on top of the boots, hat or sleeves. Make the chain, measure it so the length fits your piece all around and make few rounds with single crochet stitch until you reach the width that suits your piece. If you are going to brush it. Brush it now, before sewing it on the doll. Then sew the stripe using front loops as your guide to position them evenly and sew nicely. Using this method, what will be the easiest one for many of you, you can add any yarn you have available. Suggestion: add the fuzzy yarn to your doll before sewing the parts together and if possible brush them before sewing as well. On the photo below you can see I brushed arms. Believe me that brushing legs was difficult with both of them stuffed firm and connected to the body. Try to avoid my mistake and brush legs before making body. And that is it! Your Winter Doll is done. Hope you will enjoy this pattern and this Christmas surprise someone with one of these little cuties. For any help or questions you might have regarding this pattern, please feel free to contact me. Wishing you all wonderful rest of the week! See you soon with something new! …on what I have been up to for the past month. It sure did pass fast and I haven’t posted any news during pretty long period of time. Due to some minor health problems I had to take some time off from crocheting and staying away from PC. That resulted with brand new ideas I started to wort at so all this ended great and we will have many new things to work at pretty soon. Before I show you and talk to you about my newest project, I would like to show you photos of few dolls I made for friends. Little Strawberry Shortcake and Woody you can see on the photo below are dolls I made for local friend. None of these patterns was mine. 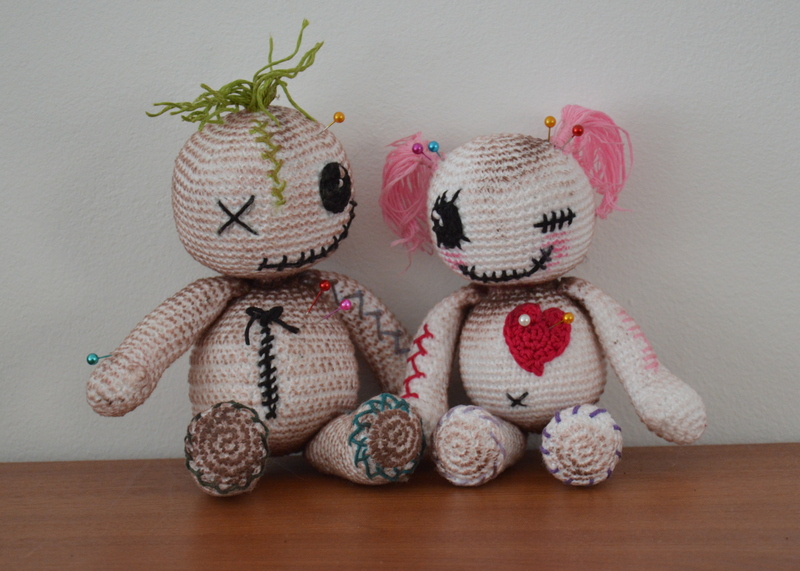 Had to make dolls in few days and didn’t have time to come up with pattern of my own. Instead, I used patterns from my pattern library. I have a huge collection of all different patterns from many famous and non famous designers. I think that each one of us, who is in this craft, has this “mania” of collecting patterns and making to do lists for our future projects. At least I do! I can tell you that this list, of what I would like to do and try, is huge. Unless I end up with something urgent to make (like these two little dolls) most of the time those patterns just sit and wait some better times (while I keep loading new ones on top of them). Both ended up cute and patterns I worked on were nice and easy as well. For Strawberry Shortcake pattern I used Yolita Amigurumis pattern. Clicking on link provided will lead you to Yolita’s blog. From there you can go to her Facebook page. Feel free to contact her if you will have hard times finding Strawberry Shortcake pattern. She will be glad to help you. Original pattern name is Rosita Fresita! Woody I made following the pattern made by Siemprejosefina. This one is not free. You can find it on Etsy. The thing I changed on both are the eyes. I painted eyes on both of these dolls. I also made hair on Strawberry Shortcake little bit different than from original pattern (but only because had different yarn, this one was lighter weight so had to improvise a little). Last month I got contacted by wonderful and so kind doll maker from France, her name is Arlette. She sent me mail asking for my BB dolls measurements. She creates dolls from textile and wanted to make BB couple but in same proportions as my original dolls. Instead of sending her measurements I made her two dolls (boy and girl) and send them so she could get to see them in real and make dolls based on visual experience, rather than working with plain numbers. I really enjoyed working at those two dolls for her. I called them BB bros and they both ended up very happy and sweet. Arlette was pleased as well what made me even happier. To thank me she send me two of BB dolls but in textile. Oh my God, was I surprised and happy when I got the package!!! I am not good in sewing and sewed dolls were always special treat and treasure for me. Love them even more than crocheted ones and receiving BB dolls in textile for me felt as Christmas! I have no words to express my gratitude and thankfulness to Arlette for taking her time to make these little ones for me. They are absolutely beautiful! Their names are> The Little Green Eyes Princess and The little Captain Red. Arlette made me this beautiful card (which I forgot to take photo and prepare for this post…) where she drew these two little dolls and wrote their name. She also sent me Sugar’n Cream yarns! I am bragging, I know…but it was such a beautiful gesture she made, and I still feel very thankful to her. Anyways, here is the photo of dolls I made for her and dolls she made for me. By now I talked about and showed you the projects I finished. Now can tell you more of what I started to work on and what is going to show and share with you soon. For a long time I wanted to to moveable joints and head crocheted doll. Sometimes I felt as the idea on how to make one was haunting me through the nights. Had many ideas by now, but never really started or tried to make one. The period while I had to stay away from hook and PC, I took time to give it deeper thinking on how I would make doll moveable. So…my idea on making moveable joints! The whole idea is making arms and legs first. Start them from bottom, work to top, and keep opened. Attach them to the body with buttons from the inner side of shoulders, hips and inside the body. Arms and legs to make from two pieces, connected them in elbows and knees with tiny crocheted additions on sides of the legs (sewed through lower leg or arm part) and make them moveable front-back. For the head I have different idea. Will try to crochet head in head. Small ball looking part that will be worked in addition to the body, will place inside the head (will crochet the head around the neck and around this little ball piece). Will talk about head and how this idea will work as soon as I start working on it. By now I have tried to make one arm to se how the elbow joint wil work and it is really working great. That kept me going and continue with making legs (what I will show you in a little while). Both legs turned out great. Look at the photo. Legs look really good. The hips or this attatchemt where I sewed the hips to the body felt little wobbly, and at first I thought it was becasue there was no stuffing, so I hurried to finish at least the half or two thirds of the body to be able to stuff and check if the wobbling will persist, and to my sadness it did. Stuffing didn’t help. Both legs are very moveable in hips and make doll look like a string one. Not good at all! Idea with the buttons will have to be dropped and changed with something else. To keep the same shape of the legs and body I think will just try to cut the threads I used to sew the buttons and attach legs to the body, and instead of button attachment will use old method, sewing it from the inner thy sides, through the body and attaching both legs same time. This should work and keep legs stay closer to the body and move nicely and not wobble around like these. So keep fingers crossed! I am going back to work and hope to get this moveable doll done by next week. Will keep you informed how it goes. If you have any ideas that might help, please, feel free to drop a line here or on my mail. I am always happy to hear from you. Wishing you all happy end of this week and wonderful blessed weekend!